The National Fire Prevention Association announced that the theme for Fire Prevention Week 2010 will be "It's Fire Prevention Week. Protect Your Family From Fire" Start planning your Fire Prevention Week activities now. Have a grown-up sound the smoke alarm & practice the plan w/everyone living in your home. If there is a fire in your home, there will be smoke. A smoke alarm will let you know there is a fire. A smoke alarm makes a loud noise – beep, beep, beep. When the smoke alarm sounds, get outside and stay outside. Go to your family outside meeting place. Ask a grown-up to show you where the smoke alarms are in your home. Ask a grown-up to test the smoke alarms to make sure they are working. 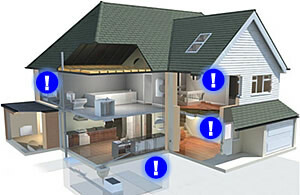 WHERE'S YOUR CARBON MONOXIDE DETECTOR? Fire Prevention Week started to commemorate the Great Chicago Fire in October of 1871. The Great Chicago Fire killed more than 250 people, left 100,000 homeless, destroyed more than 17,400 structures, and burned more than 2,000 acres. United States President Calvin Coolidge proclaimed the first National Prevention week in 1925. President Coolidge noted that some 15,000 lives were lost in the United States alone during the previous year. "This waste results from the conditions which justify a sense of shame and horror; for the greater part of it could and ought to be prevented... It is highly desirable that every effort be made to reform the conditions which have made possible so vast a destruction of the national wealth". The National Fire Protection Association continues today to make National Fire Prevention Week a priority and counts on the participation of tens of thousands of fire and safety personnel to reduce the risk of fire and its toll on society. Fire Prevention week has historically been observed beginning on the first Sunday in October and ending the following Sunday. Protect Your Family From Fire"